Katsuyori Shibata welcomed everyone to start the show. The crowd at the Grady Cole Center was hot all night, with lots of folks wearing NJPW and Bullet Club gear. Very solid opener. It was a physical match where both wrestlers showed a ton of potential. Shibata watched intently from ringside. Fredericks threw some big-time chops, and Connors had a Boston crab applied on Fredericks as time expired. The fans gave both wrestlers a standing ovation after. Archer attacked all the young lions at ringside during his entrance. The early portion of the match mostly consisted of Taylor and Archer working over Skyler. Cabana eventually got a hot tag, and there were some decent exchanges between Skyler and Archer. Cabana rolled up Taylor for the pin. Archer and Taylor laid out Cabana and Skyler afterwards. They also laid out Fredericks and Connors, who had come to ringside as seconds during the match. This was hyped as O-Kharn's United States debut. Tracer X got a lot of offense in before losing, including a beautiful hurricanrana, slingshot clothesline, and a slingshot into a downward spiral. O-Kharn, who kind of seemed like a cross between Killer Khan and Great Muta, used an iron claw, then transitioned it into a unique backbreaker-like submission while still holding onto the claw. O-Kharn then did an iron claw slam for the pin. They had the second-best match of the night. The crowd was super into Scurll. There were some "Elite" chants, but nothing overwhelming. Cobb was introduced as the ROH Television Champion and had the belt with him. King and Cobb started by trading power moves and throws. Scurll and Gresham followed with some great transitions that led to dueling chants for the two. King really shined at various points of the match, including hitting a hurricanrana on Cobb, then doing a flip dive outside onto both Cobb and Gresham that brought the house down. Back inside, Scurll powerbombed Gresham for a near fall. From there, Cobb went on an impressive run that included a standing moonsault and doing a double pumphandle suplex on both King and Scurll simultaneously. Despite that, Scurll and King regained control. Scurll broke Gresham’s fingers and hit a piledriver on him for the pin. Tiger Hattori came out to referee the match, receiving a standing ovation and loud “Tiger” chants. A basic match here -- both guys worked hard. It was essentially a squash that a lot of fans treated as an intermission. The beginning of the match had some good action mixed with comedy. At one point, Finlay hit a pescado on Chuckie T and Williams hit a Death Valley Driver on Romero for a near fall. Williams eventually secured a crossface on Chuckie T, forcing him to tap. The ending felt somewhat abrupt. Really good match -- especially the second half. Beretta hit a running flip dive to the floor, which led to a lot of brawling outside the ring. He draped Robinson on the rail, then jumped off the apron with a stomp to Robinson’s back. Inside, Beretta went for a tornado DDT, but Robinson blocked it and tossed Beretta stomach-first on the top rope. Robinson followed that with a gutbuster for a near fall. Beretta ended up selling his abdomen the remainder of the match. Robinson did a diving headbutt to the small of Beretta’s back and hit two powerbombs for two near falls. Outside the ring, Robinson was on the floor and Beretta nailed him with a running shining wizard off the apron. Beretta then hit a tornado DDT on the floor. Back inside, the two traded German suplexes -- before Beretta hit another tornado DDT for a near fall. Beretta did a piledriver on the apron that really got the crowd going, then followed it up with a shining wizard and a snap piledriver for another near fall. Robinson, who had a bloody nose by this point, came back and hit Pulp Friction -- but he was too exhausted to go for the pin. Robinson tried another Pulp Friction, but Beretta countered with La Magistral for a very close near fall. I think part of the crowd actually thought they were going to see a title change. Robinson nailed Beretta with a hard lariat, but Beretta hit the Dudebuster for yet another near fall. These two had the crowd going completely nuts at this point. Beretta did a top rope hurricanrana, but Robinson rolled through with a sunset flip for a near fall. Robinson was able to maintain momentum, hitting another Pulp Friction for the pin. Both received a standing ovation afterwards. This was a very solid New Japan-style main event. 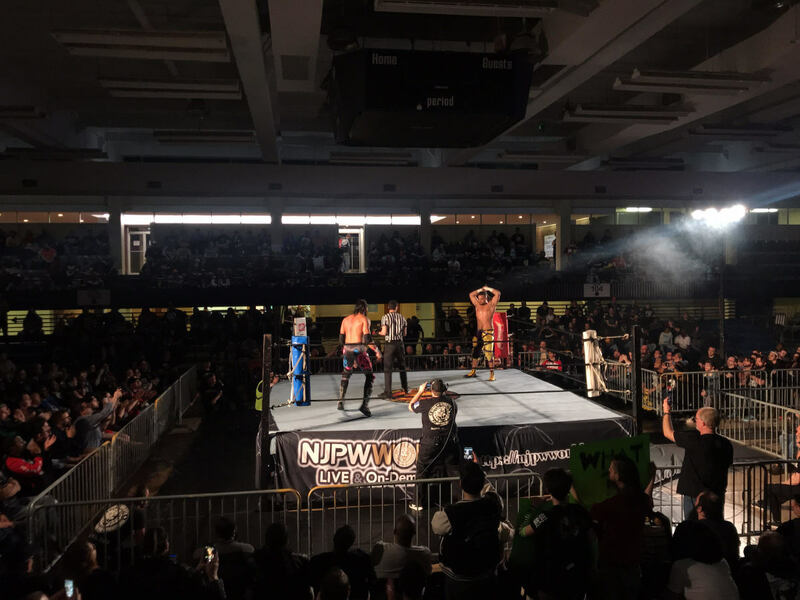 Robinson cut a promo to close the show, thanking the fans for coming and apologizing that there weren’t more Japanese wrestlers on the card, citing the government shutdown. That led to a very loud “FU Trump” chant. Robinson said New Japan would come back with the full crew at some point in the future. Beretta extended his hand for a handshake. Robinson said he wasn’t going to shake his hand, then held it high. Beretta held his hand high, they high fived, hugged, and wrapped up the show. Overall, this was a very fun, well-paced show that clocked in right at 2.5 hours. They really made It feel like a true New Japan spot show, with an NJPW ring, young lions from the LA Dojo seconding at ringside, and intros in both Japanese and English.